I could write a five hundred word post and not even scratch the SURFACE of how much I love Soyrizo Breakfast Burritos. And once you add black beans, avocado, and chipotle cream? Forget about it! Did you know that Soyrizo was Trader Joe’s highest selling item last year? Out of all the items in the store! Everyone loves this stuff. These Black Bean Soyrizo Breakfast Burritos are sure to be a huge hit with vegans and omnis alike. This recipe was made especially for one of our good friends and awesome Kickstarter backers, Katie. She is a nurse that works insane hours, so we aimed to make a Black Bean & Soyrizo Breakfast Burrito that was delicious and easy to prepare. As a bonus, this makes a huge batch that can be stored in the fridge for simple, yummy vegan breakfasts all week. Hearty, healthy, savory, and delicious! Vegan soyrizo breakfast burritos with avocado, black beans, and chipotle cream. Make a big batch for easy breakfasts throughout the week! In a large skillet, heat the grapeseed oil over medium high heat. Add the onion and sauté for 1-2 minutes until the onion becomes slightly translucent then add the garlic. Sauté for another minute then add the soyrizo. Keep stirring for 1-2 minutes then crumble in the tofu. Mix the tofu into the soyrizo until it is thoroughly covered and the tofu turns orange. You want the yummy soyrizo flavor to get into the tofu! Stir in the black beans and reduce heat to medium. Cook for another 3-5 minutes, stirring often. Heat the tortillas in a covered skillet on medium heat for 10-20 seconds. Spoon a dollop of chipotle cream onto a tortilla and top it with a heaping scoop of the soyrizo mixture. 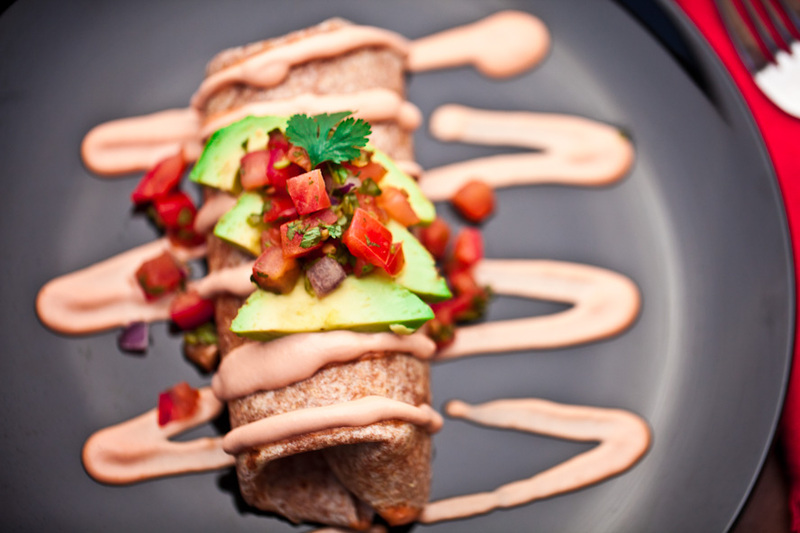 Roll up your Black Bean & Soyrizo Breakfast Burrito and top it with more chipotle cream, avocado, and pico de gallo. Chipotle Cream- Soak the cashews for 2 hours or overnight, then drain. I usually keep soaked cashews in the freezer, but if you're short on time, you can boil the cashews for 10 minutes to soften. Combine the soaked cashews, sea salt, salsa, and optional chili powder in a high powered blender. Mix on high until the chipotle cream is smooth. Did you try these Black Bean Soyrizo Breakfast Burritos? Leave us a comment and tell us about it! And while you’re at it, snap a pic and post it to Instagram with the tag #carrotsandflowers 🙂 It will totally make our day! If you loved these Black Bean Soyrizo Breakfast Burritos, check out our other healthy, filling vegan breakfast options like our Mac Daddy Vegan Breakfast Sandwich or our Vegan Breakfast Hash! I made this cream in advance of dinner tonight and threw it on my leftover fajitas and it was amazing. I can’t wait to have the full dinner later! !